JetBlue Airways is a relative newcomer in the airline industry, but they have already secured themselves a great reputation for their outspoken views on customer service. 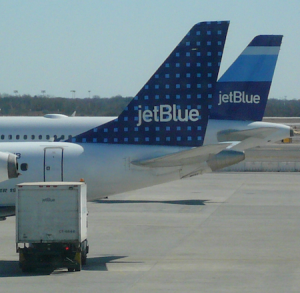 JetBlue is present at hundreds of airports around the United States and throughout the world. If you are interested in the airline industry, JetBlue is a great place to have a career. Here are the basics that you need to know before you begin your application. If you’re looking for information on downloadable and printable JetBlue Job Application, you’ve come to the right spot. We’re here to help you land at JetBlue! There are a large number of jobs available at JetBlue. These fall into a few main categories: in-flight, on-ground, airport operations, and corporate. In-flight positions include pilots and flight attendants. Attendants can expect to start out making about $20 an hour, but this can quickly go up to around $24 per hour. Attendants can see their pay go as high as $50,000 per year. On-ground jobs, such as baggage handlers, typically start out around $13 per hour and then move upward. More advanced jobs that require specialized roles, like mechanics, will make quite a bit more, depending on experience. Positions in airport operations, such as reservation agents, can make about $30,000 to $40,000 per year. Corporate roles will see pay that reflects their position and their experience within the role. There are a diverse array of these, ranging from legal, to finance, to human resources. JetBlue is not the biggest airline in the U.S., but they do have one of the best reputations within the business. They have a strong customer base, and the experience that they give their loyal customers is a great one. This has made them from a small airline to a major contender within the business. JetBlue takes care of their employees, just like they take care of their customers. They offer benefits, such as 401(k) retirement accounts, health and life insurance policies, paid time off, and heavily discounted travel costs. The company even has their own credit union to better facilitate their employees and help them handle their personal finances a little bit better. You must be 18 years old to work at JetBlue Airways. It is preferred that applicants have open availability as many locations are open 24 hours a day, and having open availability will prove to make you more valuable to the company. You must have a high school diploma or a GED to apply, while some positions may require advanced training or a college degree, depending on the role you are searching for. JetBlue employees are expected to be hard working and knowledgeable about their company and of all relevant laws that apply to their work within the company. This job revolves heavily around customer service, too, especially because of the company’s values on the subject. Acting professionally and courteously to JetBlue customers—both current and potential—is a must, regardless of your role within the company and how much direct customer interaction is actually had. The first step to working for JetBlue is to fill out the application. You can the JetBlue Job Application on the official JetBlue home page, down at the bottom. Scroll down, find the “Talk to us” tab, and click on the “Work here” link. From here, you will be taken to an area where there is a lot of information on the different career choices through the company. You can search for specific opportunities, or you can skip this and go down to the bottom of the next page and begin the application process. Spend at least an hour on the application, being sure to fill things out accurately and thoroughly. Highlight your work experience, being sure to draw attention to any and all customer service experience you have. At your interview, be sure to be professional and polite. Dress nicely in formal clothes, and bring a copy of your resume to the interview with you. Also, practicing the standard interview questions with a trusted friend who will give you honest feedback on your interview technique will be helpful, too. Preparing your own questions ahead of time will show a deeper understanding of the job to the hiring manager and help you to stand out above the competition for the position you are applying for. You can visit these websites to gain more knowledge when filling out your JetBlue Job Application. It’s important to know as much as you can about the company you’re applying for. Do your homework and you’ll feel more confident once you land an interview!